ATF’s FATD responds to approximately 1,700 industry requests regarding importation evaluations and domestic manufacturing examinations, and provides licensed manufacturers and importers with marking variances each year. ATF’s FATD is the federal technical authority regarding firearms and ammunition and their classification under federal laws and regulations and maintains an extensive collection of more than 14,000 firearms. ATF’s FATD responds to approximately 650 law enforcement requests each year to test, evaluate, classify and provide training regarding firearms and ammunition. The Bureau of Alcohol, Tobacco, Firearms and Explosives (ATF) Firearms and Ammunition Technology Division (FATD) provides expert technical support on firearms and ammunition to the Bureau, the industry, the general public, and law enforcement agencies. The division is the federal technical authority regarding firearms and ammunition and their classification under federal laws and regulations. FATD maintains an extensive collection of more than 15,000 firearms. FATD possesses subject matter experts who focus on new and emerging firearm and ammunition technologies and resources. The division contributes to the operation of the Bureau by providing technical guidance concerning the Gun Control Act, the National Firearms Act, the Arms Export Control Act, and other related federal statutes and regulations. FATD’s Firearms Technology Industry Services Branch (FTISB), and Firearms Technology Criminal Branch (FTCB) are responsible for matters that relate to the technical aspects of firearms and serve as the primary points of contact for other federal agencies that require assistance. 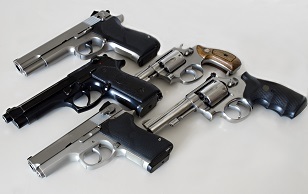 Image of five handguns lying on a table. FTISB maintains proficiency in manufacturing techniques and practices by providing support to the firearms and ammunition industry, the general public, and ATF special agents. Annually, FTISB responds to approximately 750 industry requests regarding importation evaluations and domestic manufacturing examinations, and provides licensed manufacturers and importers with marking variances. It assists the general public regarding curio and relic determinations, responds to general inquiries, and serves as custodian of ATF’s National Firearms Collection and investigative prop inventory. FTISB also supports the full life cycle of ATF firearms from procurement of new weapons, to the ultimate destruction or reutilization of forfeited, issued, or purchased firearms and ammunition. Annually, FTCB responds to approximately 620 law enforcement requests to test, evaluate, classify, and provide training regarding firearms and ammunition. FTCB provides technical reports for use in criminal prosecutions and expert witness testimony in federal, state, and military courts. Testimony includes the identification and origin of firearms, interpretation of federal firearm regulations, and technical opinions concerning criminal diversion of firearms. FTCB assists in enforcement operations, provides firearms identification, testing, evaluation, and classification. It also directly impacts the prosecution of firearms law violations and plays a key role in the enforcement actions of criminal investigations.